Perivolas hotel boasts one of the most photographed pools in the world. In the Perivolas area of the cliff top village of Oia. Back in 1969, Manos Psychas, a sea captain born in Odessa but hailing from the island of Santorini, wishing to renew his ties with his family’s island purchased together with his wife a piece of cliff with cave dwellings and stables in the Perivolas area. His vision was to turn them into an idyllic retreat. 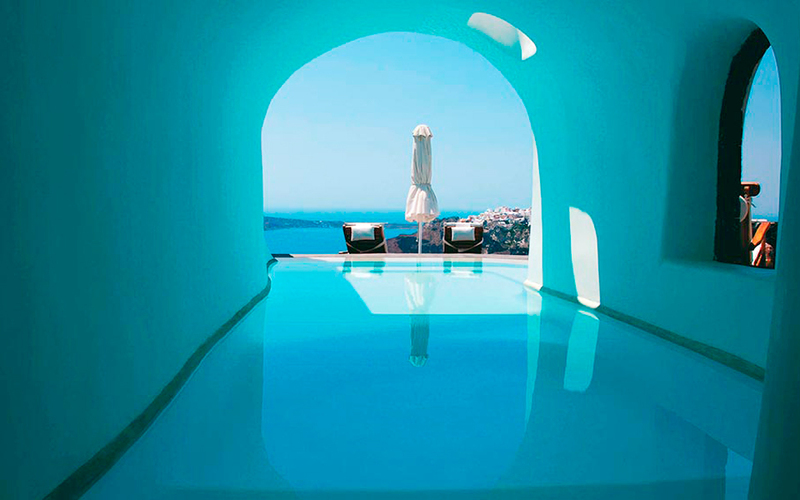 With the help of native craftsmen and remaining faithful to the tradition of Santorini’s unique architecture, they restored a group of 300 year-old caves that were once the homes of local fishermen and farmers, and gradually turned this historical setting into a luxurious complex of 17 very individual studios and suites. Oginally designed as a family home, Perivolas still feels like a private residence. Originally designed as a family home, Perivolas still feels like a private residence. 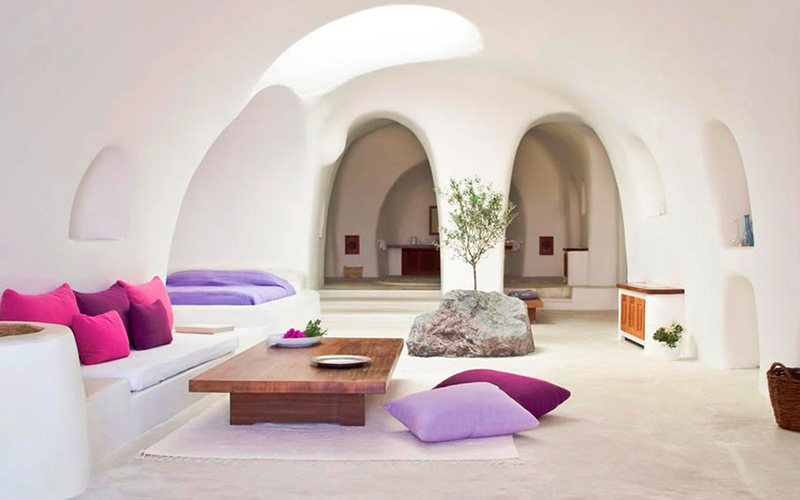 Intimate in scale and atmosphere, every room embodies the Cycladic style, with its organic forms and smooth surfaces. Breezy rooms are naturally cooled by sculpted stone walls and vaulted ceilings pierced by skylights. Beds are built into snug alcoves, adorned with a posy of hand-picked flowers. Niches and archways are scooped out of whitewashed walls, low-slung sofas offset by hand-woven rugs and cushions in vivid fuchsia and lilac. Nothing is superfluous and nothing distracts from the show-stopping views. There are no TVs and DVDs – this is a place to switch off. A place to read, recharge, relax; to sleep, rest, and dream. 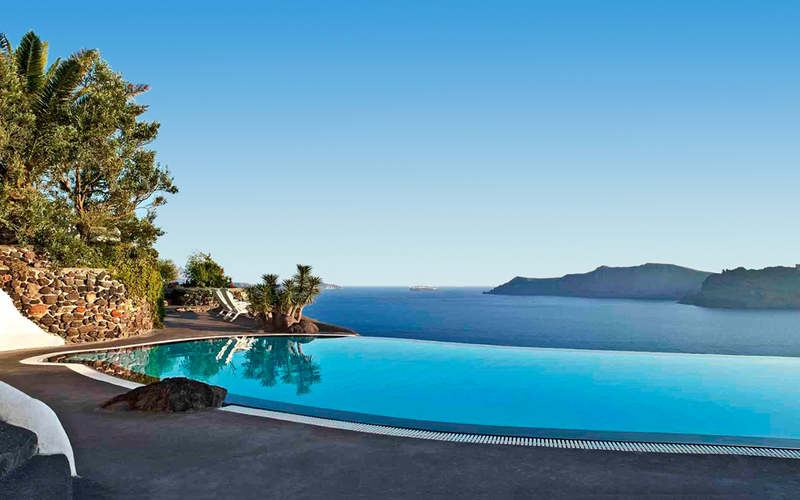 The focal point of the hotel facilities is the magnificent infinity pool, which seems to slip off the rim of the cliff, offering a spectacular setting from which to delight in afternoon cocktails and take in the beautiful sunset. Umbrellas and sun loungers offer you the comfort to relax and enjoy the invigorating Aegean sun. The swimming pool offers a spectacular setting from which to delight in afternoon cocktails and take in the beautiful sunset. The hotel also boasts a Wellness Studio, with a 24-hour a day fitness room, with state-of-the-art equipment coupled with stunning views of the caldera, an outdoor jacuzzi overlooking the volcano, a steam room, and a jet shower. Massages and a variety of face and body treatments tailor-made for each and every guest are available upon request. The Perivolas restaurant located in a converted wine cellar, serves contemporary Greek dishes prepared with seasonal local produce and the finest seasonal ingredients. For cocktails or dinner, gather around the candlelit poolside and delight your palate under a starlit sky. Savor a glass of wine from the selected list, including the best local vintages, or a plate of meze, the traditional small dishes of Greek specialties.